Admired for his lively brushwork, Thomas Sully was the leading portrait painter in Philadelphia in the second quarter of the nineteenth century. Historical subjects such as this one were rare in his oeuvre of well over two thousand portraits. Sully studied first with a succession of miniature painters, including his brother Lawrence. In 1807 he moved from Virginia to New York City, and later that year he traveled to Boston to meet the portraitist Gilbert Stuart. He settled permanently in Philadelphia in 1808 but soon afterwards made a trip to London to study with Benjamin West. In England, Sully also familiarized himself with paintings produced by other contemporary artists. He was especially influenced by the fluid style of Sir Thomas Lawrence’s portraits. The Passage of the Delaware was commissioned by the state of North Carolina for the Senate Hall of the State House in Raleigh—one of many contemporary history paintings sponsored by the young American government. According to the register of paintings that Sully kept, he began the canvas on August 7, 1819, and finished it a little over four months later on December 15 (some three decades earlier than Emmanuel Leutze’s more famous version of the subject at the Metropolitan Museum of Art, New York). Sully had suggested the subject, “the passage of the Delaware, preparatory to the battle of Princeton,” to the governor of North Carolina. This event, a turning point for the American military during the Revolution, took place on Christmas night 1776. 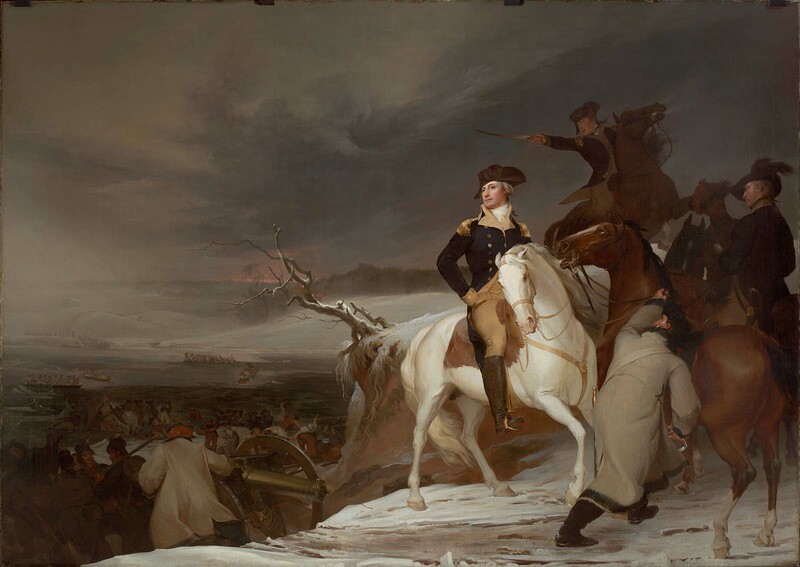 General George Washington and his troops unexpectedly crossed the dangerously ice-clogged Delaware River from Pennsylvania to New Jersey in a snow storm to surprise the English forces. They engaged the next day at the Battle of Trenton, a crucial victory for the Americans. Paying close attention to accounts of the unfolding of events that fateful December night, Sully depicted the moment before George Washington dismounted to join his lieutenants in crossing the river; the general has sent a brigade with artillerymen across first, as evidenced by the cannon visible over the crest of the hill. Sully’s image of Washington is that of the composed and decisive leader, dramatically highlighted and isolated from the surrounding flurry of activity. Sully’s painting was never hung in the State House. Although Sully had corresponded with the North Carolina governor regarding the dimensions of his canvas, he had already begun painting by the time he received a reply. The final composition was too large to fit in any of the spaces of the Senate Hall. Instead, shortly after its completion, the artist sold the painting to John Doggett, a Boston frame maker who also exhibited pictures; Doggett made the current frame and showed the painting to the public. It was purchased from Doggett before 1841 by the Boston Museum—no relation to the Museum of Fine Arts, but rather a theater with a picture gallery located on Tremont Street—where it remained until 1903, when the owners gave it to the MFA. 1. Governor William Miller to Daniel L. Peck, Esq., Raleigh, North Carolina, April 19, 1817, quoted in Philipp P. Fehl, “Thomas Sully’s Washington’s Passage of the Delaware: The History of a Commission,” Art Bulletin 55, no. 4 (December 1973): 596.